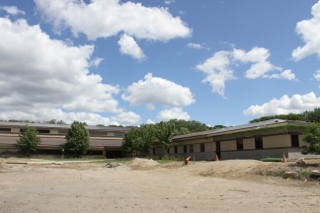 Avondale Middle School was one of a few firsts for Aluminum Supply Company. Most notably, this was the first project we have supplied where the project management team consisted of women, most of which are NAWIC members here in Detroit. Donielle Wunderlich (Project Manager, George Auch Company), Jacqueline LaDuke Walters (Project Manager, LaDuke Roofing), and Nancy Marshall (Acting Sales Representative, Aluminum Supply Company) worked as a team to put together this construction project. 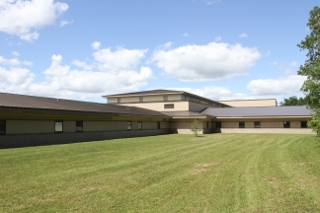 Avondale Middle School is also the first job ASCO supplied Berridge® Roll-Formed roof panels. A number of ASCO fabrication employees have experience operating the roll forming machine. This allowed for a quick turn out of over 400 24 ga. Aged Bronze panels, most of which had an overall length of 44 feet. The length of the panels presented a challenge, due to special conditions the roll forming took place in our facilty in Detroit. Typically panels are rolled on the job-site and directly installed on the roof, which requires less logistics. 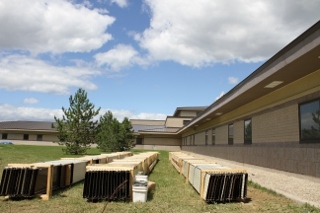 The difficulty was in crating 400 44 foot long panels in a fashion that would protect them from damage, and allow them to be hoisted onto the roof in Rochester Hills. With the help of experienced craftsmen, an overhead crane, and a couple forklifts the crates were built, then loaded on to trailers for transportation on time. "Working with LaDuke Roofing and George Auch Company was an excellent experience for us. Communication was key with all the scheduling and deliveries, and that went off without a hitch." This project is featured on pages 30 - 33 of the September 2011 edition of CAM MAGAZINE.